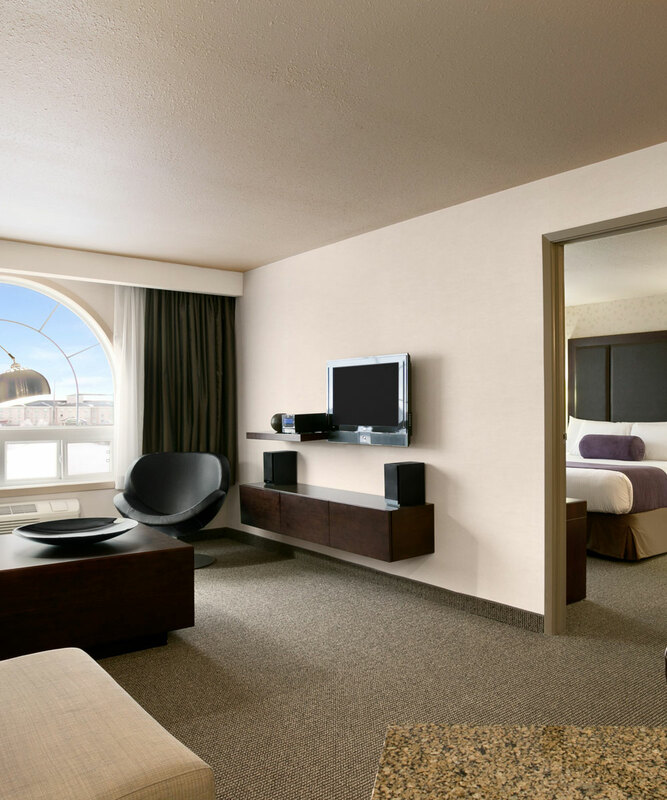 Rest assured, the Days Inn Regina Hotel knows how to accommodate your needs. 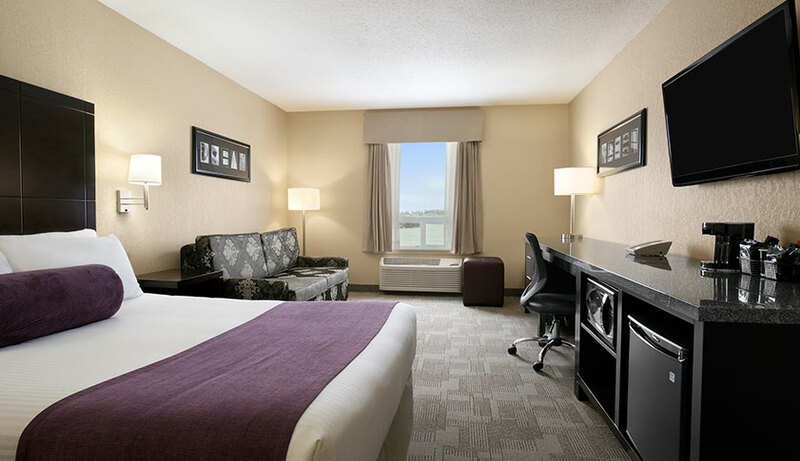 Located on Eastgate Drive East, our hotel is accessible from all major highways, close to many shopping centres and just minutes from downtown Regina, Saskatchewan. 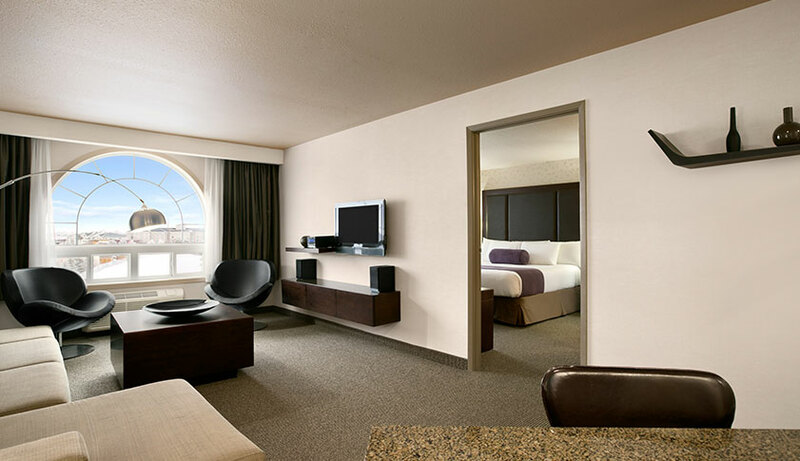 We offer 129 beautifully appointed hotel rooms and suites with all of the amenities you expect. 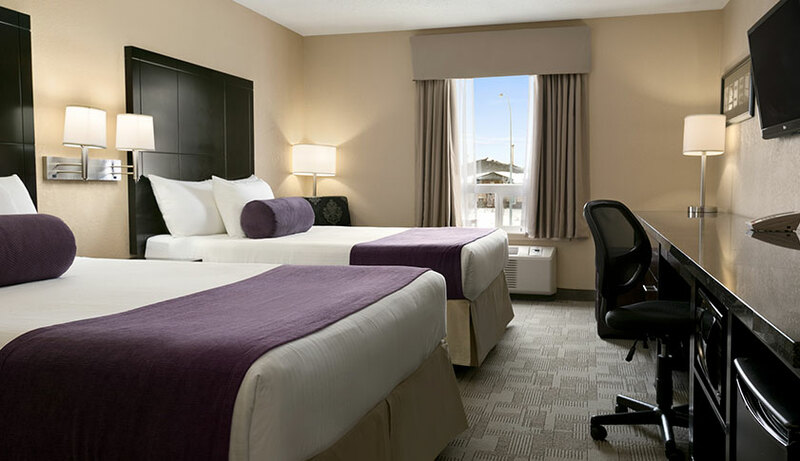 From classic rooms to kitchenettes and family-friendly accommodations, Days Inn Regina is perfect for quick visits or extended stays. Our excellent accommodations, friendly staff and impressive hotel amenities are just a few things that make us the best choice under the sun. For your convenience and our best rates, book your room or suite online using our secure reservation system. Take a look at our special packages and promotions , designed to give you the best value for your money, or check out our discounts for groups or teams booking 10 or more rooms. This spacious classic hotel room is ideal for families, with two comfortable Queen beds and a long work surface perfect for homework or colouring! This room features a mini-fridge, flatscreen TV, coffeemaker with complimentary coffee and tea, microwave, hairdryer, an iron with ironing board, and free Wi-Fi. Perfect for live-work accommodations away from the home office, this room features a luxurious King bed, a pull-out sofa, a large work desk with an ergonomic chair and fourth-floor secure access. In-suite amenities include a mini-fridge, flatscreen TV, coffeemaker with complimentary coffee and tea, microwave, hairdryer, an iron with ironing board, and free Wi-Fi. 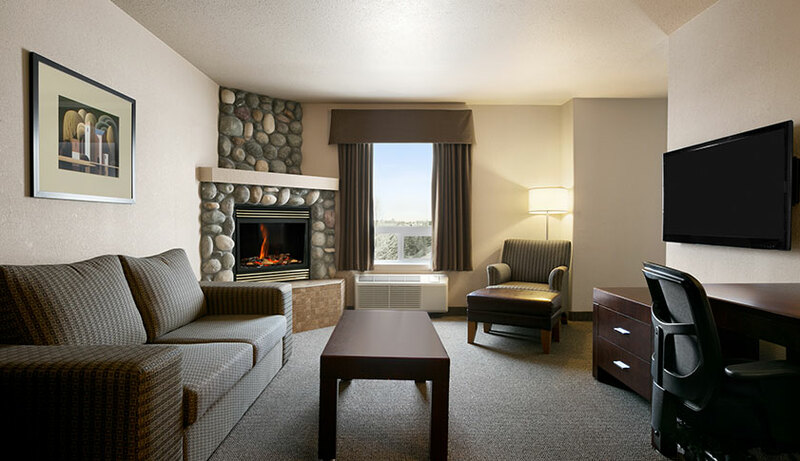 Live and work in luxury in the Fireplace Suite, featuring a cozy gas fireplace and a King bed. Sit down to work at the large desk with an ergonomic chair, and choose between an in-suite conference table or pull-out couch to suit your needs. With a flatscreen TV, bright windows, two air conditioners and a jetted tub, this suite’s amenities also include a mini-fridge, coffeemaker with coffee and tea, microwave, hairdryer, an iron with ironing board, and free Wi-Fi. Make yourself at home in this spacious extended stay suite, with a King bed in a separate bedroom, a sectional couch and TV in the private living space, a galley kitchen with stove top burners, mini fridge, sink, cutlery and dishes, microwave and coffee maker. This suite has two bright windows, two air conditioning units, a full-length mirror and optional secured fourth floor access. In-suite amenities such as a hairdryer and iron/ironing board and free Wi-Fi are also included. Travelling with the kids? This suite is designed to meet the needs of your family, with one King bed in a semi-private room, and additional two Queen beds. The suite features a large work desk with an ergonomic chair, a flatscreen TV, and granite countertops in the kitchenette area, complete with a mini-fridge, microwave and coffee maker. 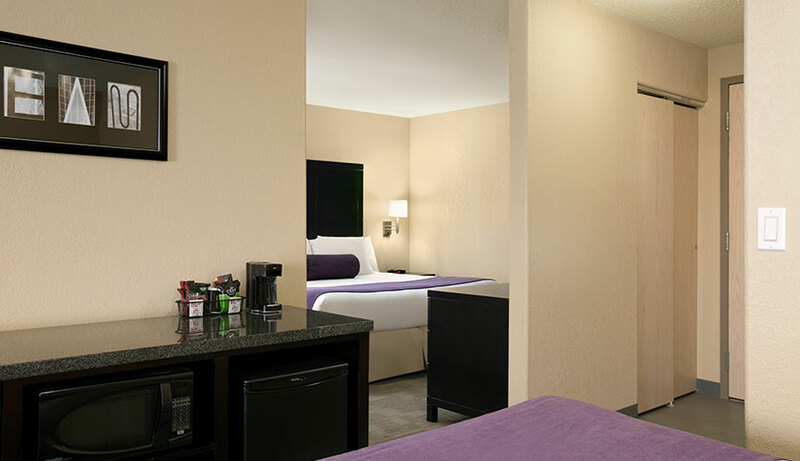 In-suite amenities also include a hairdryer, iron and ironing board, and free Wi-Fi. 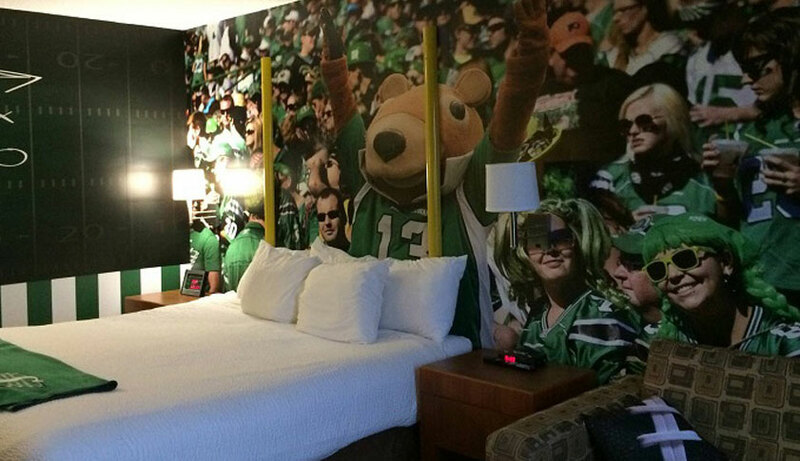 Welcome to any sports fan’s dream: Our fun, green-and-white football inspired theme room features a kid’s room with bunk beds and two TV’s with PS4 (free games and movies included) and football-themed decor throughout. Parents, escape into your separate room with a King bed or soak in the jetted tub. With bright windows and two air conditioning units, this room’s in-suite amenities include a mini-fridge, coffeemaker with coffee and tea, microwave, hairdryer, an iron with ironing board, and free Wi-Fi.